Eucalyptus has a distinct, menthol-like fragrance and it is a popular herb for home remedies. In the garden, it is most often used as an ornamental and it makes a stunning indoor plant. Many crafters enjoy incorporating the dried leaves in their creations as well. You may be most familiar with eucalyptus as the favorite plant of Australia's koala, which is where the tree is most plentiful. Eucalyptus essential oils are also very common and useful throughout your home for everything from cold remedies to aromatherapy. Eucalyptus is a fascinating plant with an exotic flair and many uses. It is definitely one to consider adding to your container garden or planting as an annual. According to "Rodale's Illustrated Encyclopedia of Herbs," there are more than 500 species of eucalyptus. The type that is usually referred to for the home gardener, is E. globulus or Globe Eucalyptus. This is what you will find in most nurseries. 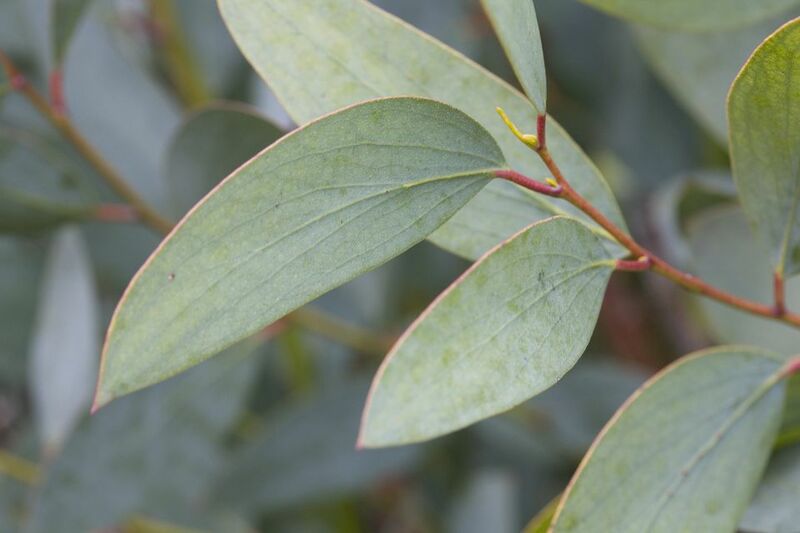 Eucalyptus is native to Australia and most species grow as a tree, though some are more like a shrub. This plant is considered an evergreen, though it can lose its leaves. The leaves begin as light green ovals which take on a darker shade of green as the tree ages. In USDA Hardiness Zones 8-10, eucalyptus grows into trees of towering heights. These trees are the very same ones that feed the koala bears in Australia. For the home gardener, however, eucalyptus is grown as a potted shrub or plant. It is trimmed back often and the resulting branches are most commonly used for crafts. For the gardener in cooler climates, grow eucalyptus in pots and bring them indoors for the winter. Eucalyptus can also be grown as an annual as well. You will not get the huge branches that are available in craft stores, yet you can easily gather enough leaves to dry for your family's needs throughout the winter. Eucalyptus is also used as a very pretty indoor plant. When growing it indoors, note that eucalyptus is considered a heavy feeder and requires full sun. Highly adaptable to most soils, the main concern is to pay close attention to basic feeding, lighting, and watering needs. It is interesting to note that many varieties of eucalyptus also produce such fragrant blossoms in the wild, that they are considered highly desirable for attracting bees. For most of us, this may not apply as the plant will probably not blossom under less than optimal conditions. Cut the branches to your desired height as the plants grow. All parts of the plant are used medicinally: leaves, bark, and roots as all contain the potent oil. Important Note: This oil is never to be used straight on the skin or ingested alone. Follow the suggestions below for preparing herbal infusions, salves, and other natural remedies for using eucalyptus. Eucalyptus branches can be dried on the stem by hanging the branches upside down in a small bunch. You can also remove the leaves and place them on a paper towel or drying screen. With either method, allow the eucalyptus to air dry until the leaves are slightly leathery for older leaves and crispy for the smaller leaves. Once dry, store eucalyptus leaves in glass jars with a tight sealing lid. Choose a container that is large enough to hold your entire eucalyptus branch. Mix 1 part glycerin with 2 parts boiling water. Pour some of the liquid into your container, then insert the eucalyptus until they are standing in about 3 inches of liquid. Keep the jar in a cool, dark place and inspect the plants weekly. Add more liquid as needed to keep it at the optimum level. It may take anywhere between 1-8 weeks for all the leaves to change color. When they have, the process is complete. Remove the eucalyptus branches, pat them dry with a paper towel, and hang them upside down for 2-3 days before using. Make an Herbal Chest Rub - Make an herbal salve and use eucalyptus as the herb while adding a little less beeswax than normal. Make An Herbal Infusion - It is very similar to a cup of tea without the tea leaves and you do need to wait until the infusion has cooled completely. Simply add a few eucalyptus leaves and drink. Add a little sweetener or other herbs to improve the taste if you like. An infusion of eucalyptus leaves can also be used as a soothing skin antiseptic. Make Your Own Herbal Cough Drops - The process is similar to making lollipops (without the stick), but you will use your herbal infusion as the flavoring. Pour the liquid candy into a baking sheet and cut it into squares before it hardens completely. Make a Steam Inhalation - Simply inhaling steam infused with eucalyptus can bring relief from nasal congestion and other cold symptoms. You can also add eucalyptus essential oil to your aromatherapy diffuser and run it while you sleep. Please note this document has not been medically reviewed. Consult your doctor or herbalist prior to using and with any questions you may have. Beyond its obvious medicinal uses, the herb can be used for a number of other things around the home. Make a simple syrup using eucalyptus and enjoy it during cocktail hour or to sweeten your evening cup of tea. It pairs nicely with mint, honey, lemon, and lime. The same scent that we find soothing and somewhat refreshing is not at all appreciated by biting insects. Using eucalyptus oil, try 1 teaspoon diluted in a cup of carrier oil such as grapeseed or olive oils. Use this as a repellent when you are working in the garden. The essential oil can also be added to a custom blend to create a natural bug repellent.